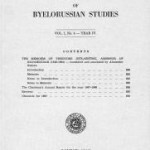 In 1965 the Anglo-Belarusian Society began publishing a yearbook – The Journal of Byelorussian Studies. After over two decades of silence the Journal is back, has an online digital archive and welcomes new submissions. The Journal is published jointly by the Anglo-Belarusian Society and the Centre for Transition Studies in London. This entry was posted in ABS and tagged abs, Anglo-Belarusian Society, call for papers, JBS, publications. Bookmark the permalink.